Story: Fei Yingxiong (Ashin Shu) has been in love with his colleague Bao'er (Madina Memet) for years now, but can't find the courage to tell her about his feelings. In his free time he draws comics, in which he makes famous heroes fight for law and order. One day, he desperately asks his heroes to help him win over Bao'er, and suddenly one of those heroes, Wong Fei-Hung (Vincent Zhao), is stranded in the modern era. Trying to get a grip on his new situation, Wong meets Huo Yuan Jia (Andy On) along with his student Chen Zhen (Chan Kwok Kwan), who both come from his time period as well and showed up on a film set. 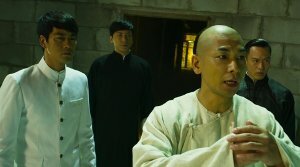 The forth hero they meet is Ip Man (Dennis To). Together they realize that they have to find the man who appeared in their dreams if they want to find a way back to their own time period. In their dreams Fei told each one of them a numerical sequence. But it's not until somebody steals their money, which they were given by the merciful Bao'er, and they apprehend the thieves' leader, that they finally make progress. The leader doesn't want to get into any more trouble with the four martial arts masters and decides to help them. The numbers turn out to be Fei's telephone number. Unfortunately, Fei's cell phone was stolen not long ago. Nevertheless, the heroes still manage find Fei while he is eavesdropping on his boss (Zhang Ziwen) declaring his love to Bao'er. So, there is not much time left for the heroes to help Fei with his love's bliss. Review: This martial arts flick had a lot of potential. Four of China's greatest heroes come together and fight for law and justice facing all things evil. Apparently, not only the title is reminiscent of "Justice League". This could have been China's next big superhero movie. But in the end, it turned out to be a comedy... That, too, could still have worked. After all, the characters offer a lot of material to poke fun at. It becomes clear quite quickly, though, that the four heroes actually just take a back seat to the comic artist's love story. But at the same time, he is constantly upstaged by the four heroes' charisma, so that you have to ask yourself what the movie's actual goal is. The answer might be that it simply tries to make fun of everything. The only problem is that this plan doesn't work out because the plot is too tedious and ridiculous. And we are not talking about the time travelling plotline here. In fact, it actually is a nice idea to make the four heroes experience a culture shock by putting them into the modern era. After all, China has changed quite a lot, but the movie did not use this idea to its full potential. The four of them get into the subway on horseback and give each other a kiss to get a free meal out of it at McDonalds. This is the kind of level we are dealing with here. A lost opportunity. Same goes for the character depiction. Vincent Zhao plays Wong Fei-Hung as he does in both the TV series and the movie "The Unity of Heroes", and the heavy use of the title melody always manages to conjure a smile on our faces. He can also shine in some fighting sequences, which are pretty nice to watch, especially because Leung Siu-hung ("Ip Man") took care of the choreography, but the heavy use of wire-fu is too obvious and takes away some of the fights' intensity. Same goes for the rather dominant CGI. But in the end, the movie is just short of fighting sequences. The fact that the other heroes don't actually get any real combat, is especially weird. Huo Yuan Jia is played by Andy On ("Mad Detective"), who is a pretty good martial artist, and Dennis To has already embodied Ip Man ("The Legend is Born"). Chan Kwok Kwan has already been able to convince with is resemblance to Bruce Lee in "Shaolin Soccer". And he is also pretty convincing as Chen Zhen, a part which Bruce Lee played as well. 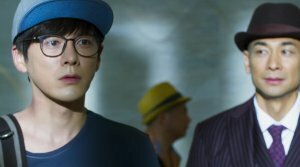 The relationship between Chen and his master also leaves room for some humorous scenes, and it needs to be pointed out that the humor works because the actors actually have pretty great timing. Not every punch line hits home, but more often than not there is something to chuckle about, which, of course, is obligatory for a well done comedy. Nevertheless, you can't necessarily call "Kung Fu League" a successful movie. Some critics complain about the fact that the heroes are portrayed disrespectfully and simply represent caricatures. Unfortunately, the latter might be true, but at the same time, the fact that they are heroes, should not rule out a disrespectful way to deal with characters. In fact, I found it rather refreshing to have somebody poke fun at China's hero cult. Sadly, there is not that much more happening with the characters. Most of the time, the movie simply does not know what its general objective is, apart from the omnipresent love theme. And when we turn to the love story, we do realize that this is supposed to be the movie's core, but the filmmakers just didn't put a lot of effort into it. Everything seems stereotypical, wrongheaded and the narrative arc doesn't really work. Then there is also the rather fake bad guy, who is part of a forgettable finale, including the obligatory awakening of the true hero. The finale would have needed to turn out much better to actually convince us. Towards the end of the movie, at the latest, you do realize that this is not a martial arts flick per se. For that there are far too many special effects, which - by the way - didn't turn out well either. This might even be bearable during the more humorous scenes, but as soon as the action gets more serious, the CGI turns out to be one of the movie's biggest weaknesses. However, what is really problematic is the fact that the movie doesn't tap its full potential and we mostly just get a stupid romance movie. And yet, there are so many moments between the four heroes which are quite funny and could have been used as a foundation for a special friendship. But as it happens, the movie stays rather superficial and, in the end, you can't actually pinpoint what it is that you've just seen. Mostly, it's a simple comedy, which turned out particularly disappointing because the movie didn't know what to do with four of the biggest heroes in Chinese cinematic history.